Distributor: Licensed in North America by GKIDS/Cinedigm. Notes: This film actually received its debut during the 2011 Toronto International Film Festival, which explains the discrepancy between the copyright date shown here and the description of this film in most sources as a 2012 release, as was the case for its wide release in Japan. Momo and her mother Ikuko decide to move back to the island countryside after Momo's father passes away suddenly in an accident during a research expedition. 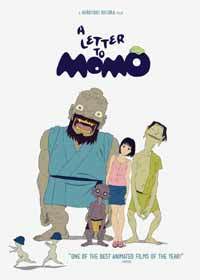 One day, Momo found an unfinished letter addressed to her with just the words, "To Momo...." in her father's drawer. Filled with regret, Momo always wondered what her father was going to say in the letter. Well, she's going to get some help soon in the form of some unlikely guardian spirits. When I picked up this title, the first thing that struck me was how the main character Momo, bears a stricking resemblance to Major Kusanagi Motoko from Ghost in the Shell and Kei from Jin-Roh. A couple of minutes of research on Anime News Network confirmed that the director for Momo, Hiroyuki Okiura, is also the character designer for all the three aforementioned titles. I was immediately wary; can someone who directs and designs for science-fiction and mecha movies possibly deliver on a story based on fantasy and folktales? Well, worry not, folks. You'd be pleasantly surprised by how well this movie was handled in its storytelling and humour. Let's start with what I loved best: eye-candy. I almost never, NEVER, pass up on good eye-candy, especially by big production houses such as Production IG, and where eye-candy is concerned, Momo truly delivers. Momo opens with three water droplets falling out of the sky and landing on the title character's head. Then we are greeted with Momo and her mother, Ikuko riding on a ferry to the Japanese island. The scenes and visuals are so realistic that it makes me nostalgic about my own ferry trip from Hiroshima to Miyajima island; I can almost feel the wind and smell the oil from the ferry. The closeups are fantastic, as are all the details, down to the finest level. It is all very subtle: even body language is well animated. I especially love two scenes in the beginning where Ikuko tries to stop her father from carrying her luggage, and how he slows the truck he's driving at an intersection to avoid scraping the rear-view mirrors. These sorts of blink-and-miss-it moments can probably best be appreciated after repeat viewing; almost like Colorful, there is something new to notice and appreciate with each rewatch. Unfortunately, Momo tends to drag a little in the beginning. Considering this is a two-hour feature, the interaction between the guardian spirits, Iwa, Kawa, and Mame does not actually start until almost more than half an hour into the movie. The first quarter is spent on Momo being frightened and running away most of the time through the old shopping district of her hometown. Now, if the main point had been to show off the beautiful old architecture of the small-town setting, then the artist has pretty much achieved their goal. But I suppose given the context of coming face-to-face with supernatural beings, there's no helping it: even in Spirited Away, a portion of the screentime is spent on Chihiro overcoming her initial fear. Which leaves the other three-quarters of the film to explore Momo's interaction with the spirits; changing from her inital fear to a more or less helpless resignation that she may have to live with their antics for the rest of her life. The pace here finally picks up and with the help of Iwa, Kawa, and Mame, Momo slowly becomes less withdrawn, manages even to make new friends and to finally forgive herself, leading to the best part of the movie. Yes, this film is reasonably emotional; in the end, even I was not immune to a sniffle or two. Recommended Audience: Teens and up. Children will probably be mildly entertained by Iwa, Kawa, and Mame, but I do think a mature audience is needed to understand themes like loss and regret.